It is a modular system with removable buttplate. The shorter torso and smaller buttplate will better fit smaller divers. The buttplate is much smaller and more pliable providing comfortable fit. 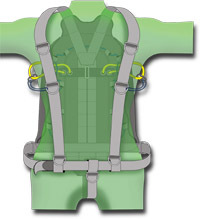 This model can be fitted with a climbing harness in place of removable waistbelt. The heavy duty inflation assembly was moved to the left side and is now interchangeable with the top dump valve. 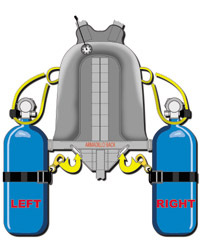 The divers can configure Armadillo as a standard wing with inflator on top and dump valve on the bottom. The bottom part of the wing can be folded in half. This feature can provide better fit for thinner and smaller divers. The waist belt is removable so Armadillo A2 can also be attached to climbing harness to create more streamlined rappelling/climbing system. The light canister can be worn on the waist belt under the wing. Pair of removable D-rings on the lower back to carry reels, cameras, lights and scientific equipment. Outer abrasion resistant shell is made from Cordura 2000 denier material. Wing bladder is made from RF welded CORDURA 560 with PU coating. It resists hydrolysis, low temperatures, and hydrocarbons. The kit is virtually indestructible. Designed mainly for side mount cave exploration, the Armadillo has evolved into a streamlined rugged system that can be used for all types of diving. Extreme cave explorers can use the system as it was perfected for, tight, remote, hard-to-reach caves anywhere on the planet. 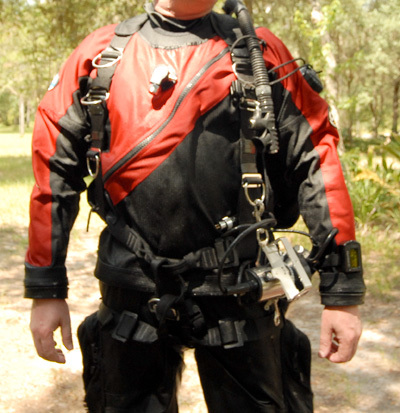 Rebreather divers can incorporate their CCR / SCR units as a back mount scrubber stack and side mount oxygen and diluent cylinders. 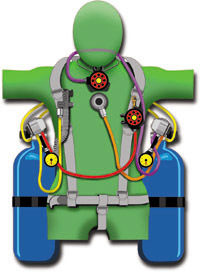 Exploration divers can back mount their bottom gas and side mount their decompression gases. 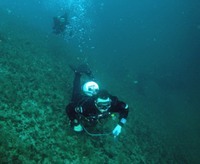 Open water divers can use the harness with a single cylinder mounted on their back. The Armadillo system did not evolve over night; hundreds of dives over several years were conducted in multiple locations and environments. From shallow reef diving in the Florida Keys, to extreme deep cave exploration in Tennessee, high flow blue holes in the Bahamas, cold wreck diving in the Great Lakes, archeological discoveries in Mexico’s Yucatan, and swimming with hundreds of Hammerhead sharks in Coco’s Island, the Armadillo side mount harness has been tested thoroughly. From these experiences, the Armadillo system has been perfected to provide the serious diver with a rugged tool to go where no diver has ever gone before. The Armadillo harness is designed to fit most standard sized adults. It is not designed to fit extremely small or extra large people. Sizes from 5 feet (152 cm) tall, 115 pounds (52 kg) to 6 feet, 5 inches (196 cm) tall, 250 pounds (113 kg) should have little problem sizing the harness to fit them. Armadillo Sidemount Cave Dive from Curt Bowen on Vimeo.